I'm really beginning to enjoy hunting with this little rifle. Success two weekends in a row really builds my confidence in 7.62x39 from the AR platform. Same 125grn Nosler ballistic tip load I used on the doein this thread. This time a bit closer in at 175yds shot from atop the access ladder on an abandoned combine, DRT as could possibly be at bullet impact. 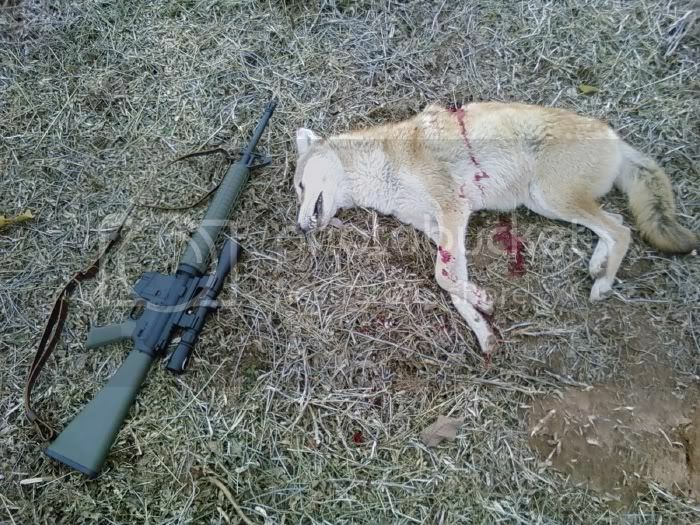 This yote is a good deal healthier looking than most of the yotes I've killed in the past. No story this time, I just though my fellow AR guy's would like to see the platform in use during season. the recruiting office is in the mall, go knock yourself out. And I was worried about graphic pictures being viewed by more sensitive members.....But that.....that's downright creepy. Dang even dead that's the healthiest lookin yote I've ever seen. It doesn't even look mangy. Thats the best looking yote i've seen in some time. They got all mangieee here this summer. But now that winter has set in, I have hope that it will kill off some of that. I'm hopping all this snow we are getting tonite sticks till friday. Then i'm going out with the 243 for sure. Maybe the LR-308 if the ACOG (TA11E) get's here before Thursday. The only good coyote. Is a dead coyote. Okay Krochus, I'm in Rudy, and I've got a X39 AR, too. Where is this abandoned combine? OK! it's not abandoned per sae, but rather it just wasn't in use at the time. You're not by chance the Mr Hill who gives CCW classes are you? If so we've met.